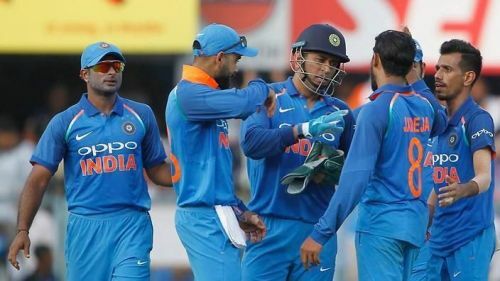 Dinesh Karthik and Vijay Shankar have claimed the two spots in India's World Cup 2019 squad that was surrounded with uncertainty. The MSK Prasad-led selection panel held a press conference in Mumbai to announce the 15-member squad. Let's have a look at the squad which will be on the flight to England. Already being labelled by many experts as the greatest one-day batsman of all time, Virat Kohli will be the key to India's fortunes in the World Cup. His captaincy and team selection will play a huge part in India's journey. The impact that Rohit Sharma has created in the last few years instils fear in the mind of the bowlers. His triple 200s is an evidence of his tendency to play long innings, which is required for India at the top of the order. Dhawan has been the leading run-scorer for India in the last three 50-over ICC tournaments. India would be hoping to get some explosive starts from Gabbar as he is a vital cog in the batting line-up. MS Dhoni will bring a lot of calmness to the dressing room. His guidance to the wrist spinners in the middle overs and his presence in the death overs while batting could decide the fate of many matches in the World Cup. Termed as a street-smart cricketer, Kedar Jadhav has surely punched above his weight. More than his unusual hitting areas, his sliding part-time off-spinners could prove to be a partnership breaker. Hardik Pandya will slot in as the primary all-rounder of the team. More than his big hitting, it will be interesting to see is whether he can bowl 10 overs consistently in every game. He is expected to score big in the death overs. No one has picked more wickets in ODIs than Kuldeep Yadav since Champions Trophy 2017. The uncertainty of a chinaman bowler will be an X-factor for the opposition in the middle overs. Just like Kuldeep, Yuzvendra Chahal has been impeccable with the ball during the second powerplay. With his exploits at M.Chinnaswamy Stadium, Kohli could use him in the back end of an innings as well. Jasprit Bumrah, who is the No. 1 ranked ICC bowler, will be leading the Indian bowling attack. He has been the go-to bowler for Kohli for the last 16 months and will once again be a force to reckon with especially in the death overs. Bhuvneshwar Kumar will be lethal in overseas conditions. The Meerut-born lad has been effective in the death overs and could score some handy runs at lower down the order. After making a comeback to the squad, Mohammed Shami has picked up 18 wickets in 11 games. His wicket-taking ability in the powerplay and his consistency in nailing yorkers will be handy for Kohli's men. KL Rahul will be the back-up opener in the quadrennial event. It won't be a surprise if he starts the tournament at No. 4. His form in the IPL will do a world of good to his confidence. Coming in as a replacement for Hardik Pandya, Vijay Shankar impressed everyone with his temperament in the few innings he played. His final over exploits against Australia with the ball put him on the radar. His all-rounder skills add depth to the squad. Ever since wearing the Indian blue colours in the Asia Cup in UAE, Ravindra Jadeja has done no wrong for India. He comes into the squad as the third spinner and will be extremely useful with the bat and on the field. After being overlooked for the home series against Australia, Dinesh Karthik has been picked as a second wicket-keeper. The Tamil Nadu gloveman's experience will be handy in the World cup as he could play the role of a finisher as well.